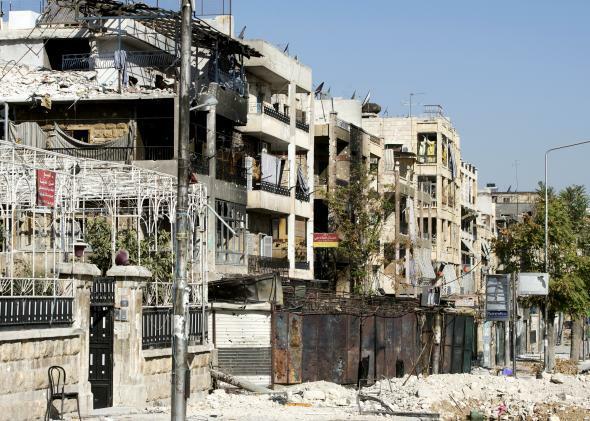 A picture taken on Sept. 28, 2012, shows damaged buildings in the northern city of Aleppo following months of clashes and battles between Syrian rebels and government forces. On a conference call with reporters this morning, Gareth Price-Jones, the country director for Oxfam in Syria, who recently returned from Damascus, discussed some of the particular challenges of working in the country. In particular, he mentioned one aspect of the crisis that isn’t often discuss, the fact that prior to the civil war breaking out, Syria was at a relatively high state of economic development. There are obviously some advantages to this from a humanitarian perspective: Relative to civilians in other conflict areas, more Syrians had some savings to fall back on, or as I discussed recently, more means with which to flee. But as infrastructure has deteriorated and people have used up their savings, it has also made some of the challenges facing aid groups more difficult. Oxfam recently helped install generators to power two water treatment plants near Damascus.